I mean- if you weren’t entertained by main character deaths, why would you even bother watching Game of Thrones? I’m gonna wait a week or so to remove the annoying spoiler half-of-image. I’m the exact opposite, which is why I have yet to watch so much of an episode of it. I’d watch the show if I had HBO. I love the overabundance of murder. Hot Damn, I knew GoT was big but this is the literally the 13th webcomic I have seen that comments on it. GoT is awesome- I started watching the series when there were only a couple episodes out and had read all of the books before the first season was over. 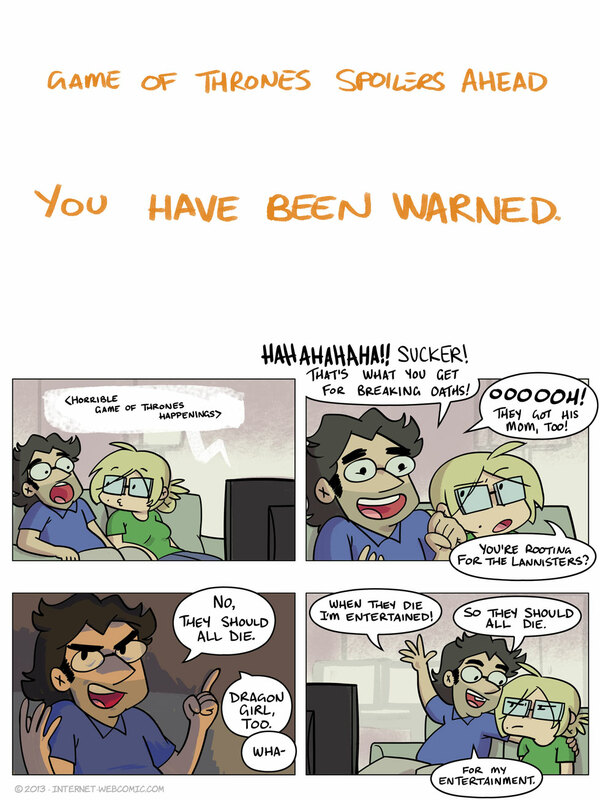 game of thrones is like a fiction made out of a team deatmatch LAN session. and in a TDM everyone dies at least one time, so they should all die, and they will. The only ones who survive are spectators. I know I might have a problem, but I really enjoy Game of Thrones because I prefer to see how the characters DON’T die. SOILER> Like Tyrion, Sam, Arya and pretty much all the Starks except the ones bearing rulership. >> I’m gonna wait a week or so to remove the annoying spoiler half-of-image.